The Barber Pro Skin Revival Kit contains everything you’ll need for a fresh looking, clearer appearance. The four products contain nourishing ingredients such as Activated Charcoal to purify the complexion while Collagen brightens and rehydrates the skin. An anti-ageing facial treatment that sits closely on the contours of the face and transforms skin in just 20 minutes. Soaked in Marine Collagen and an array of key vitamins, herbs and botanicals, the innovative mask is able to visibly improve skin tone, whilst ensuring the complexion is supple and firm. A dose of Green Tea extract offers antioxidant and antibacterial properties, which target problematic skin. This reduces excess oil and areas of redness, alongside shielding skin from damaging environmental aggressors. Awaken the delicate eye area with the anti-ageing, under-eye patches that target and eliminate signs of ageing. 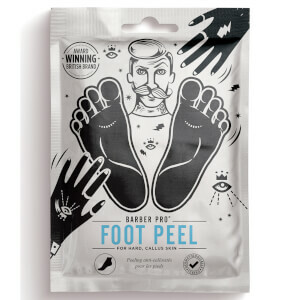 The hydrogel patches are rich in Activated Charcoal, Volcanic Ash and Marine-based Collagen, which work in synergy to deliver an array of skincare benefits. The intensive treatment reduces the appearance of fine lines, wrinkles and dark circles, whilst reviving a fatigued and puffy eye contour. The soothing and calming treatment hydrates and nourishes skin in just fifteen to twenty minutes, leaving eyes energised and youthful. A self-foaming mask that rids skin of dirt, oil and impurities. Sitting closely to the contours of the lower face, the face mask is effortless to use. Simply apply to skin and the sheet will bubble to create a micro-massage for the visage. Soaked in Activated Charcoal and an AHA Complex, the cleansing mask detoxifies the complexion, which is ideal for refining pores and reducing excess oil on acne-prone skin. The treatment works in just 10 minutes, peeling away to reveal clarified skin that is visibly firm, refreshed and clear. A rejuvenating face mask that provides a deep and thorough cleanse. Ideal for oily and acne-prone skin types, the treatment rebalances oily zones, whilst detoxifying skin. Utilising activated Charcoal, the treatment draws impurities from skin, alongside loosening and eliminating blackheads. The mask transforms skin in just 10 minutes; simply peel away and reveal a refreshed visage that is visibly clear, bright and healthy. Cleanse the skin with water, remove mask from packaging, unfold and place on face, wear for 15-20 minutes, remove mask, there is no need to rinse the skin, excess serum can be applied to neck and décolletage. Gentleman's Sheet Mask: Aqua, Glycerin, Propylene Glycol, Glycereth-26, Hydrolyzed Collagen, Sodium PCA, Camellia Sinensis Leaf Extract, Jania Rubens Extract, Sodium Hyaluronate, Butylene Glycol, Caprylhydroxamic Acid, 1,2-Hexanediol, Boswellia Serrata Resin Extract, PEG-60 Hydrogenated Castor Oil, Natto Gum, Punica Granatum Fruit Extract, Hamamelis Virginiana (Witch Hazel) Extract, Tocopheryl Acetate, Disodium EDTA, Triethanolamine, Hydroxyethylcellulose, Carbomer, Parfum, Phenoxyethanol, Ethylhexylglycerin. 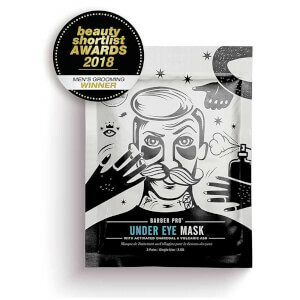 Under Eye Mask: Aqua, Glycerin, Sodium Polyacrylate, Sorbitol, Ricinus Communis (Castor) Seed Oil, Polyacrylic Acid, Cellulose Gum, Octyldodecanol, Kaolin, Charcoal Powder, Sesamum Indicum (Sesame) Seed Extract, Glycine Max (Soybean) Seed Extract, Oryza Sativa (Rice) Extract, Aloe Barbadensis Leaf Juice Powder, Ficus Carica (Fig) Fruit/Leaf Extract, Ulmus Davidiana Root Extract, Aesculus Hippocastanum (Horse Chestnut) Seed Extract, Diospyros Kaki Leaf Extract, Allantoin, Aluminum Hydroxide, Hydrolyzed Collagen, Retinyl Palmitate, Tocopheryl Acetate, Butylene Glycol, Volcanic Ash Extract, Sodium Hyaluronate, Phenoxyethanol, Iron Oxides (CI 77499), Tartaric Acid, Disodium EDTA, 1,2-Hexanediol, Benzyl Benzoate, Citral, Limonene, Linalool, Parfum. 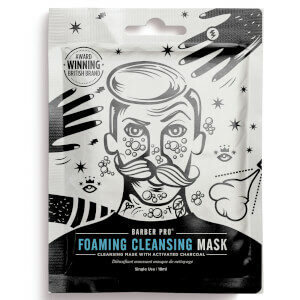 Foaming Cleansing Mask: Aqua, Dipropylene Glycol, Glycerin, Methyl Perfluorobutyl Ether, Methyl Perfluoroisobutyl Ether, Disodium Cocoamphodiacetate, Hexylene Glycol, Cocamidopropyl Betaine, Betaine, Sodium Chloride, Sodium Polyacrylate, Xanthan Gum, Phenoxyethanol, Butylene Glycol, Paeonia Suffruticosa Root Extract, Centella Asiatica Extract, 1,2-Hexanediol, Pyrus Malus (Apple) Fruit Extract, Chamomilla Recutita (Matricaria) Flower Extract, Panax Ginseng Root Extract, Punica Granatum Fruit Extract, Hamamelis Virginiana (Witch Hazel) Extract, Rosa Centifolia Flower Water, Lavandula Angustifolia (Lavender) Extract, Caprylhydroxamic Acid, Morus Nigra Fruit Extract, Solanum Lycopersicum (Tomato) Fruit Extract, Melaleuca Alternifolia (Tea Tree) Leaf Extract, Glyceryl Caprylate, Ethylhexylglycerin, Citrus Aurantifolia (Lime) Fruit Extract, Citrus Limon (Lemon) Fruit Extract, Citrus Aurantium Dulcis (Orange) Fruit Extract, Vitis Vinifera (Grape) Fruit Extract, Charcoal Powder, Disodium EDTA, Phenoxyehtanol, Parfum. 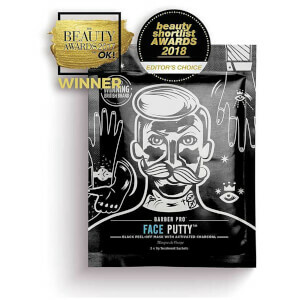 Face Putty: Aqua, Alcohol Denat., Polyvinyl Alcohol, PEG-60 Hydrogenated Castor Oil, Glycerin, Cellulose Gum, Charcoal Powder, Phenoxyethanol, Chlorphenesin, Ethylhexylglycerin, Sodium Magnesium Silicate, Algin, Trehalose, Caprylyl Glycol, Polyglycerin-10, Polyglyceryl-10 Stearate, Polyglyceryl-10 Myristate, Disodium EDTA, Citric Acid, Sodium Dehydroacetate, Vitis Vinifera (Grape) Fruit extract, Butylene Glycol, Sea Water, Lavandula Angustifolia (Lavender) Flower Water, Fragaria Chiloensis (Strawberry) Fruit Extract, Ginkgo Biloba Leaf Extract, Citrus Aurantium Dulcis (Orange) Fruit Water, Camellia Sinensis Leaf Extract, Melaleuca Alternifolia (Tea Tree) Leaf Oil, Citrus Limon (Lemon) Fruit Extract, Sodium Benzoate, Potassium Sorbate, Parfum.